Illamasqua have joined forces with Leverton & Sons Funeral Home in London to create what they call the Final Act of Self-Expression. A service, which can be booked as part of a pre-arranged service with the funeral home and costs from £450. 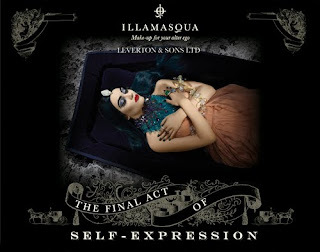 Illamasque say "This unique service encourages people for whom making-up is an intimate part of their identity to plan their final transformation - one that pays tribute to who they were in life and how they want to enter the afterlife ..."
They claim to be ‘encouraging people to self-express and embrace their alter ego in every way’. So what is involved in post mortem make up? Although law does not require embalming, from a cosmetic view it is preferable that the person is embalmed because appearance is improved. There is a base tint that is often used which looks like a dark orange coloured liquid, and it’s a tint you can brush on the face to remove the ashen look. From there you can use any kind of makeup. Cadaver makeup can be very thick and is quite comparable to theatre makeup. Lipstick, blush and Mascara would be the usual requirements. Men are usually quite easy because they don’t usually wear makeup in life. So with males, they would get some form of base and that’s it. There can be racial differences too. It is a celebration of life, and one that could be indulged for your last glamorous look.